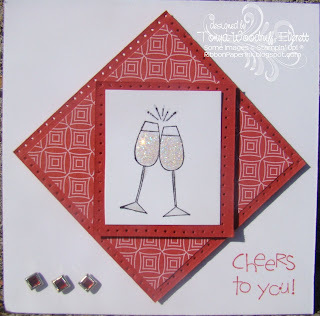 Ribbon ~ Paper ~ Ink: Cheers to crystal effects!! I can't believe it's been a whole week since I posted. Yikes! I am sorry to go missing in action! I've had a busy week, but have missed blogging way too much, so I'm back! First thing I wanted to point out was I got a new watermark! I've wanted one since day one, just hadn't found the right person to work with. I heard about Dina through another friend, she did a great job. Visit Dina's blog and check out all her available designs! She was super fast, very cost effective and wonderful to work with! Thank you Dina, I love it!! One thing I was busy with this last week was coming up with a swap card with my local group of demonstrators and many new found friends. Originally, I had planned to use my Pock et Silhouettes set but.....my first order from the new catalog arrived and I had splurged on the Cheers for You set! Wow! What a great set! I've made four cards so far (I'm going to share 2 today and 2 tomorrow) and have many more ideas swirling around in my huge head. Seriously, it's a great set. The first card I'm sharing is a version of the swap card I sent out. My friend Nancy Morgan shared a great idea with me about using chunky sprinkles and crystal effects. What a great look! 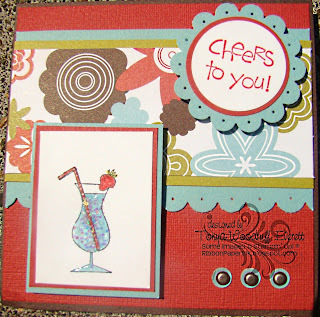 I broke open my Summer Home Simply Scrappin' kit and used the designer paper and textured cardstock! My favorite piece of this card is such a tiny detail you may have missed it. The straw in my Blue Margarita is paper pieced with a tiny piece of designer paper. I put this detail in between the first and second coat of crystal effects. It appears to be floating don't you think? What do you think? I love the detail the crystal effects provided. Don't forget to stop by tomorrow on your blogging expiditions and check out the other two creations I made with this set. Missed ya! Love both cards. The second one looks really neat. Like the glasses. Love the cards, what a great idea with the crystal effects in the glasses.....I will have to try that,I keep telling myself to think outside the box, but sometimes to no avail...LOL! thanks for sharing the cards with us! Both cards are wonderful, with great details. I especially like the glittered drink and paper pieced straw; its a great look. wow, did that set ever find a good home with you! I am happy to say I have one of the first card in my possesion and it is even more specactular irl. That second one is fantastic, love that layout and the colors...it's PERFECT and GORGEOUS :)!!! You go stampin' girl! I love seeing your card creations!!! Beautiful job! I love CE!! Wow Honey, nice glasses. ow about filling up to real ones for us, aye. Then see what happens, love ya. BM or is it DG or is it Flash or is dip sh..
That's right it depends on the day. This card is very elegant. I love the dazzling diamonds!